A recent visit to the family homestead has wiped me out. Psychologically, that is. Physically, too, as the trip was mainly to help my parents with some of their spring gardening. But my parents, especially my Mom, are difficult and heavy on the soul. It takes a few days to rebound. So, while I’m rebounding, I think I’ll share a few random thoughts with y’all. 1. I had the good fortune this week to go to both Symphony Hall (my first time, can you believe it?) and Fenway Park. Both buildings are about 100 years old. Has anyone noticed how much wider the seats are at Symphony Hall? I mean, substantially wider. You need a shoe horn to squeeze most Sox fans into the old grandstand seats. And the reasoning has always been, “Oh, people were smaller back then.” Then why the ample room for the music lovers? 2. Speaking of Fenway, I had a Fenway Martini last night. As good as ever. We introduced the guy next to us to the fabled drink. He got to the end of it, ate a peanut, shell and all as is the custom, then complained that the shells were too crunchy. Here’s the thing: He drank his beer too fast. The shells need to soak a bit. Drink slower, dude. 3. I’ve been making rye salt starter and liquid levain to make a tangy sourdough. The recipes are from the Amy’s Bread book. It kills me when it says to let the starter rise at room temperature – 75F-80F – for X number of hours. 75F-80F? Come on now, that’s not room temp – that’s a bakery’s room temp. 4. I haven’t been doing much gardening yet this spring. My mother’s gardening, yes. A garden project I’m working on for a local human services agency, yes, putting a lot of brain power into that one. But our own garden, not so much. I’ve planted a bunch of seeds, indoors and out. Some are up, some aren’t. Nothing seems to be growing in my “carrot bed” and I can’t figure out why. I hope my luck turns around. 5. Who are you, Tracey Hawkins? You took the time to hunt down my professional email address and write, “Are you the Ellen of the Dainty Dot? Kind regards, Tracey Hawkins.” And then nothing. Did you have a question? Can I help you with something? I’ve come up with lots of scenarios of who you are and why you wanted to contact me. You are a hipster and you love my recipe for trout. You’re a scout for Martha and want Dainty to be a regular on the show. You’re a book agent and think I have a compelling style and are going to offer me a contract. You’re an attorney and want to sue me for … I dunno, something. You rep a line of cookware and want to offer me some products to test. You, Tracey, are many people. Let me know which one I’m addressing. That’s it, my five random thoughts. Please feel free to share your random thoughts, too. Especially you, Tracey. Bread Cracking in the Oven—Solved! Last summer I discovered the joys of bread baking. I guess you’d call it my hobby now. And I say hobby because … well, unlike putting a Pop Tart in the toaster and waiting for the ding, there are levels of complexity at every step. There’s practice and skill and problem-solving and continual learning from mistakes. Described that way, it seems more like a sport. And, considering I currently have three different sourdough ferments tucked snuggly in the warm and draft-free microwave, perhaps I’m also a collector. Yesterday, I had one of those “Aha!” learning experiences. I made a batch of Country Sourdough from the Amy’s Bread cookbook. It was my first time making this recipe and considering my firm levain wasn’t so firm and I substituted in my sourdough starter, I wasn’t so sure the recipe would work properly. I made the dough, let it autolyze, formed it into a ball, let it rise, punched it down, let it rise again, separated into two doughs, formed boules and let them rise again – seam side down – in floured baskets. The dough looked and felt great. So far, so good. Now, in Amy’s instructions, typically once you get to this point in the recipe it’s almost as if they copied and pasted the remainder of the instructions for each and every recipe. At least for the handful of recipes I’ve tackled so far. BUT, this time she had a slightly different twist in the instructions. She said to tip the boule out of the basket onto the prepared parchment paper so the seam was now on top. Hmmm … I had not encountered that in previous recipes. All others were seam side down. Why would you put the seam up? I had two boules – I thought, “Let’s try one seam side up, one seam side down, and see what happens. I scored both loaves on top, put them in the oven, and let them go. Here’s what came out of the oven. Can you guess which one was which? Seam side up on the left, seam side down on the right. The one on the right was the seam-side down. Even though I scored the top, the steam escaping the loaf escaped through the seam on the bottom, causing it to tear. 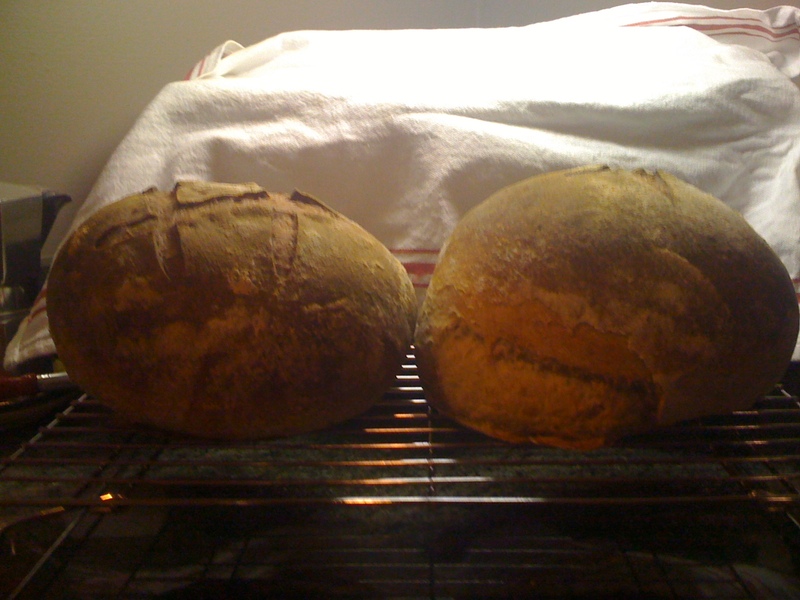 For the boule on the left, the scores through the seam on top let the steam escape. Not having a weak spot—a seam on the bottom—prevented the bottom from bursting. I tried to seal that seam as tightly as possible, but apparently not enough. This doesn’t happen with all of the breads I’ve made, but I have had this happen before. And now I know why. Problem solved. No, I’m not obsessing over this apple-based sourdough. Not in the least. But … I did keep an eye on it throughout the day on Tuesday. Good stuff was going on inside that quart container. 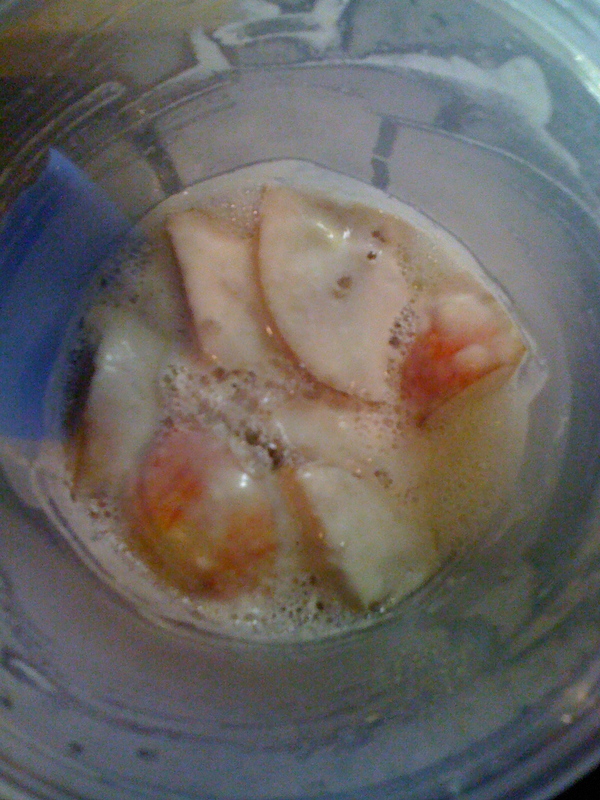 Liquid pockets continued to build up around the apple chunks. I could see bubbling going on in there – they’d form lines from the base of the pocket going upward. Occasionally some bubbles would burst forth from that area, not unlike some undersea activity where bottom feeders send up the intermittent belch. The surface of the starter was covered with tiny bubbles, too. And, it smelled nicely fermenty. All good signs. Wednesday, 5:57 a.m.: The layers have separated completely. No bubbles. Flour looks settled. 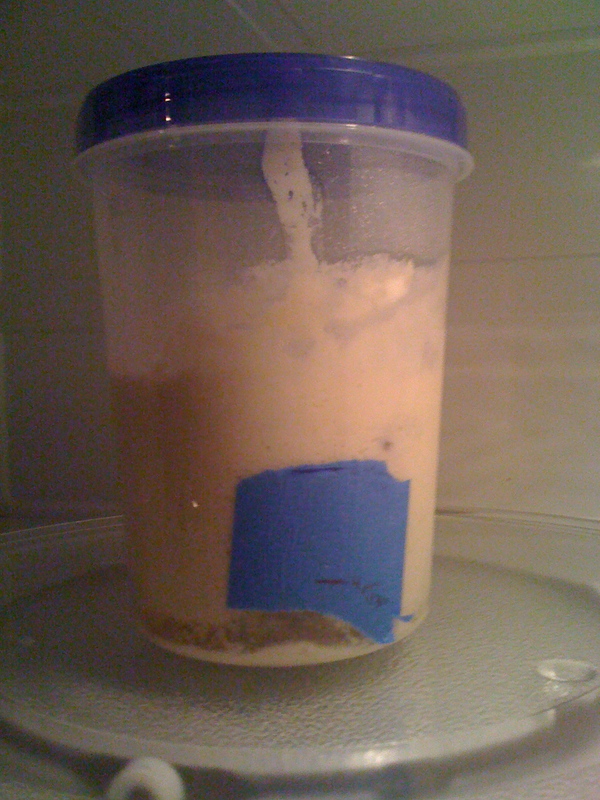 Hmm … this happened to the grape starter, too. So, I move on to the next step, which calls for me to remove the apple chunks and add 36 grams flour. Stir well. 8:06 a.m.: I took a peek—bubbles seem to be appearing again. Bigger bubbles on the surface this time. But fewer. So far. A quick temperature reading says it is 75F. The starter pulls a bit as I bring up the thermometer. Fingers crossed. Friday, 6:30 a.m. So, I just poured the starter down the drain. Again. Calling it starter is not correct—it was a mass of watery flour, that’s all. No bubbles. No yeasty activity. Nothing. I don’t understand where I’m going wrong. I look online and I see all sorts of success with wild sourdough starters. Lots of bubbling! Lots of yeasty stuff going on! And me? The starters just … stops. I will try again! I will. I just won’t blog about it—I’m getting sick of it. BUT, if anyone out there (is anyone out there? anyone?) has some advice or a wild sourdough recipe or some suggestions of where to look for success, please let me know. Help a girl out, yo. Here’s a brief journal of my sourdough starter experience. Consider it a journal of Baby’s First Days. And oh boy, if real babies are as slimy as this, I’m so glad I don’t have one. Monday. 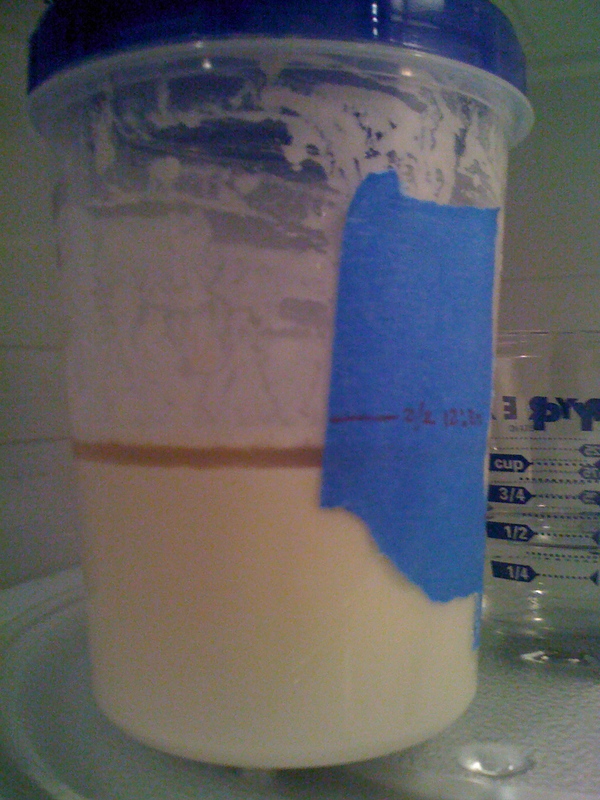 11:21 a.m. Sourdough starter roughly 19.5 hours old. Microwave trick and dissipating boiled water have warmed the starter to 74F. The best I’m gonna get at this point. Monday, 5:12 p.m. 25-ish hours old. 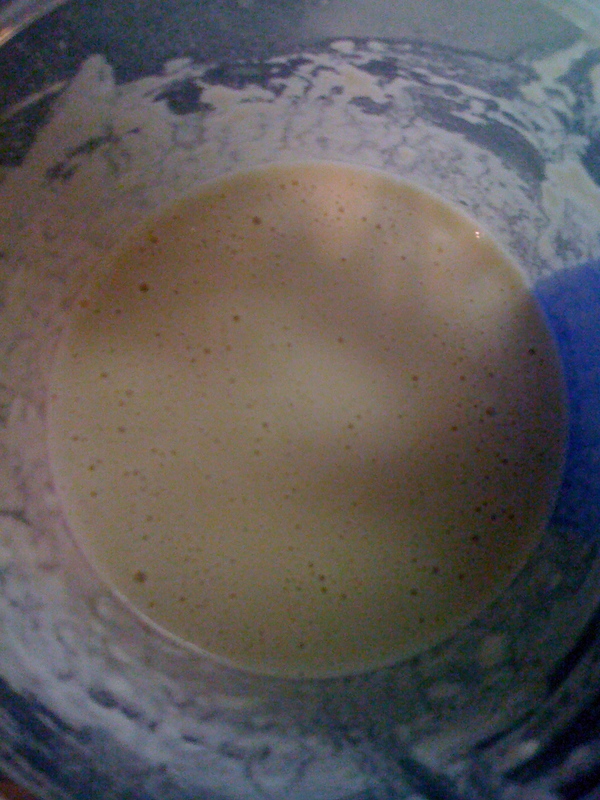 Sourdough starter has turned into bubbly goodness! It smells like … grapes. Really. Yeasty. Grapes. Alas, work prevents me from tackling Step 2 at the moment. Monday, 6:49 p.m. Still bubbly goodness, with a pleasant grapey-yeasty aroma. Added 113 grams room temperature water and 72 grams unbleached all-purpose flour. Stirred. 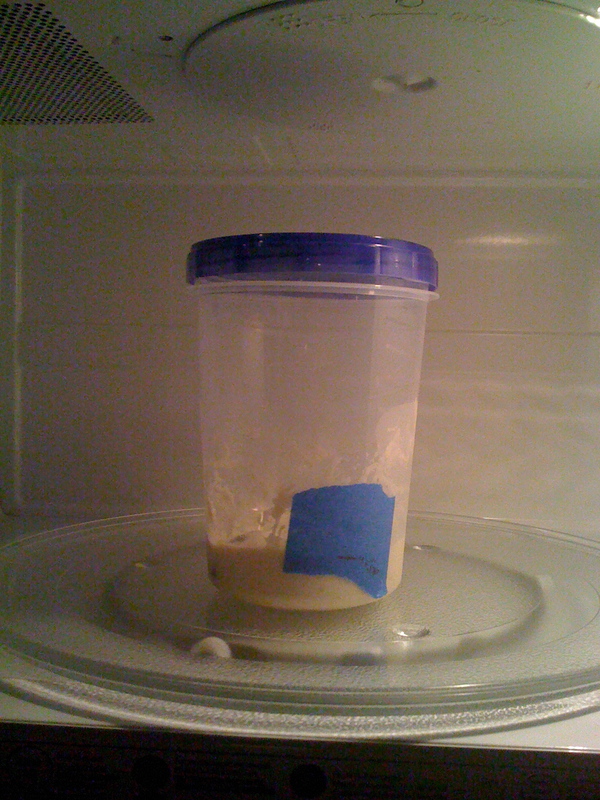 Put back in microwave. Crossed fingers. Needs to bubbey away for another 12 to 24 hours. Tuesday, 6:02 a.m. Baby Dough’s big! Must have almost doubled in size overnight. Lots of big bubbles. Hmm… should I move on to the next step? 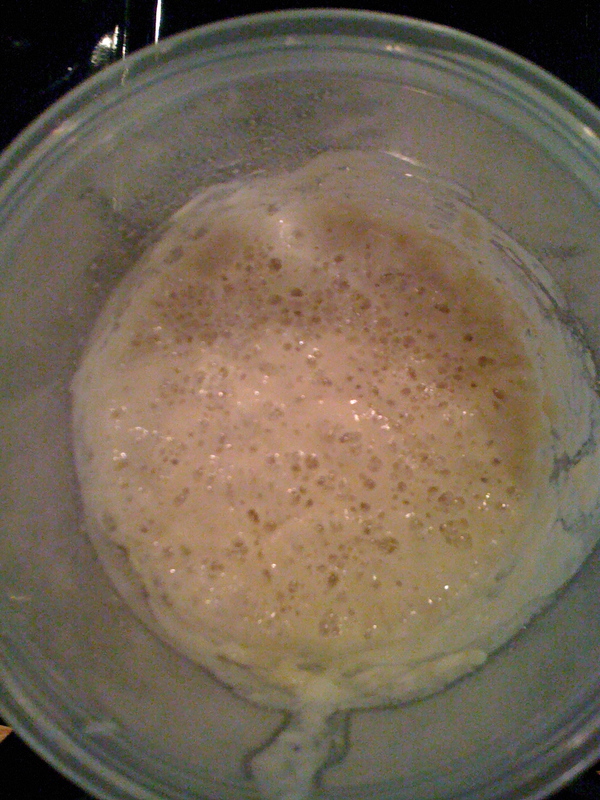 Baby Dough at about 38 hours. Such a big boy! Tuesday, 8:27 a.m.: I decided to move on to Step 3 after only 14+ hours. 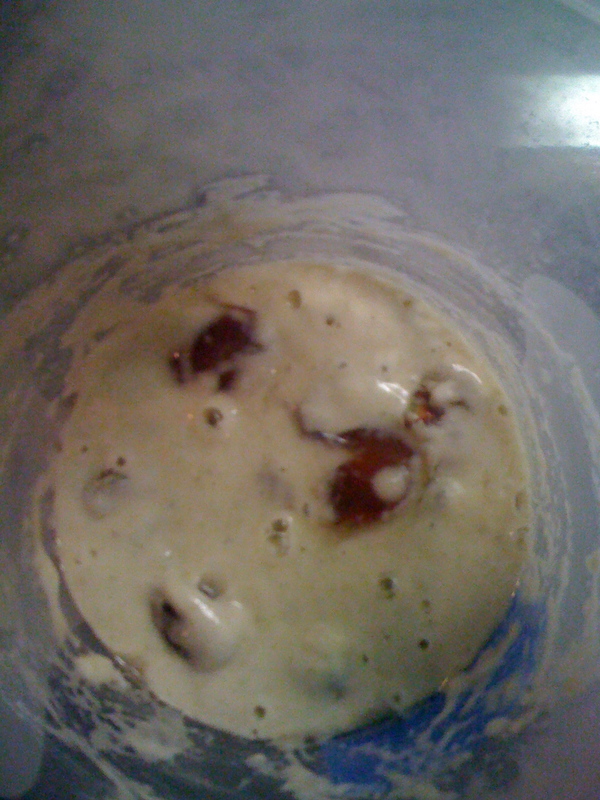 It calls for scooping out the grape remnants and a bit of the starter. It’s snot. It looks like snot. It pulls like snot. It’s baby snot. Of course the grapes all settled on the bottom and I had to scrounge around with an iced tea spoon and pull them up through miles of gooey snot. Good thing was there was a layer of liquid on the bottom through which I could see all the grapes. Finding them all wasn’t so hard through the gooey yeasty snot. Answer me this: Why would anyone EVER think this would be something yummy to add pulverized wheat to and then put in a container to cook over hot coals? That leap of faith from snot to baked goods—if you think about it, that crazy idea created civilization. Goo. Flour. Water. Heat. The wheel. The combustible engine. The Internet. Added 36 grams flour. Mixed thoroughly. Put back in the microwave. Waiting another 12-24 hours. Baby Dough’s looking a tad under the weather, a little runny. I snuggled him in the microwave with another cup of boiling water and will check back in later. For now, I’ll let him rest. Perhaps the party was too much. Beatrice doesn’t ask much from me. So, when she asks a favor or makes a request, I’m on it. “Can you make some rye bread?” she texted to me last Wednesday. I was at the airport, headed out of town until Saturday night. I didn’t have my cookbooks nearby to reference. Rye bread? There’s nothing like a good Jewish rye from New York. Thin toasted slices with butter – nothing beats it. You want rye bread, Beatrice? Rye bread is what you’ll get. I’m new at this starter thing. I’ve made one once before – the one Joanne Chang has in her cookbook – and kept it going for a couple of months. It was super easy. And reading through Amy’s Bread several months earlier, I knew there were several different types of starters. This levain thing was one of them. Okay, I’m on my way. Amy’s Bread – that’s a real bread-baker’s cookbook. I should have known there’d be something more to making this “levain” than … than whatever I had imagined. So, I turn to the recipe for firm levain. And the recipe for firm levain itself calls for Active White or Rye Sourdough Starter. Hmm…. okay. 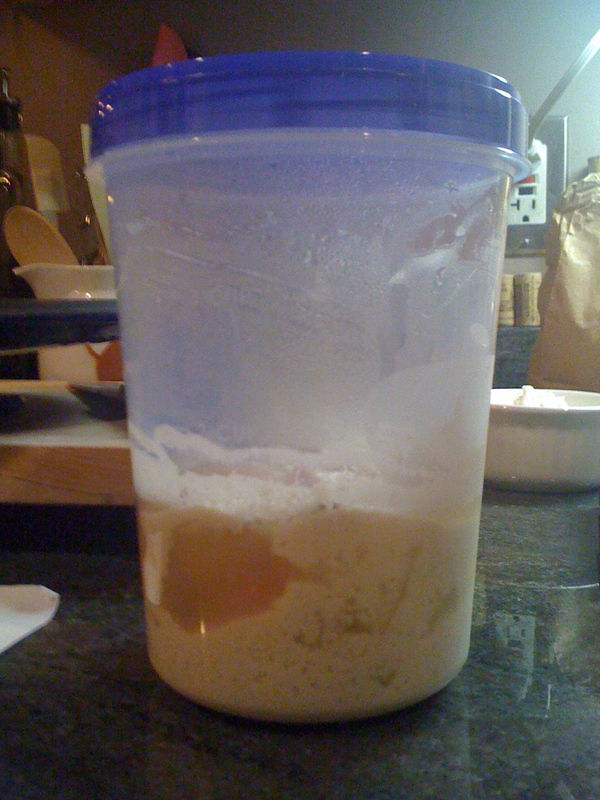 A levain is a sourdough starter made without yeast. That’s why the recipe calls for grapes. I’m assuming, correct me if I’m wrong, the grapes’ naturally musty-ness – the yeasty beasts that hang out on fruit – will provide the umpf needed to begin the fermentation process. If you add a pinch of yeast to a starter, that will kick your starter off right. And get it going quickly. With grapes, apparently you need to give it more time. Like, three days more. Oh, you’ll also see that it’s in my microwave. It’s a bit warmer in there. And, as soon as I’m done posting this, I’m going to heat a cup of water to boiling and keep that in there with the levain. The dissipating heat will warm the microwave hopefully 1o degrees or so and keep the levain warmer for a few hours. If all goes as planned, we’ll have rye bread just in time for the Super Bowl. And a levain to nurture for years to come. You are currently browsing entries tagged with Amy’s Bread at The Dainty Dot.